The wind has swept the snow off of much of the tundra. The piles you see on the right side of the photograph are all drifts behind the AMF-3 and the piles on the left are drifts behind the hangar. Yesterday we set out for the AMF-3 prepared to stay for the entire day and into the evening, just in case the forecast drop in winds came true. For a very short while, it looked as though it might… By mid-morning we started regularly seeing winds around 25 mph (which was down from 35–50 mph overnight). This got our hopes up, and we began to plan our course of action for potential afternoon flights. Unfortunately, that was as good as things got, and by the afternoon winds had climbed back up to 40+ mph. By 4:30 pm, it was obvious that things were not likely to improve, and we headed back to camp for the evening. 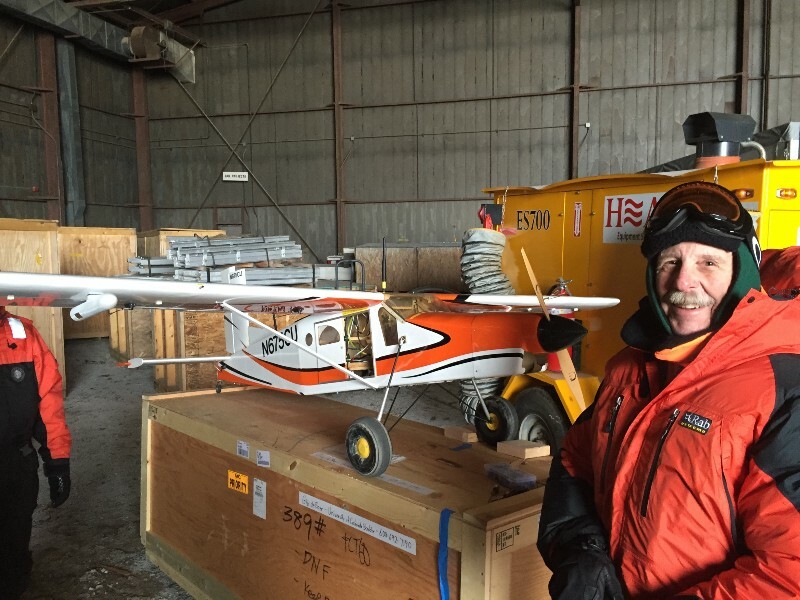 Al, in the hangar with the Pilatus. Unfortunately the winds kept her from flying again! 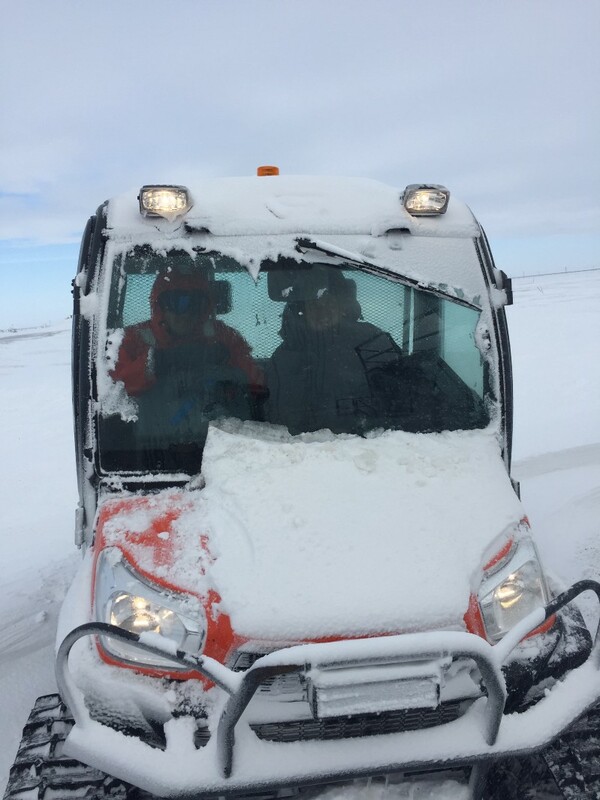 Phillip and Tevis head out during blizzard conditions in the Kubota track vehicle. This morning, we woke up to substantially calmer conditions than forecast. 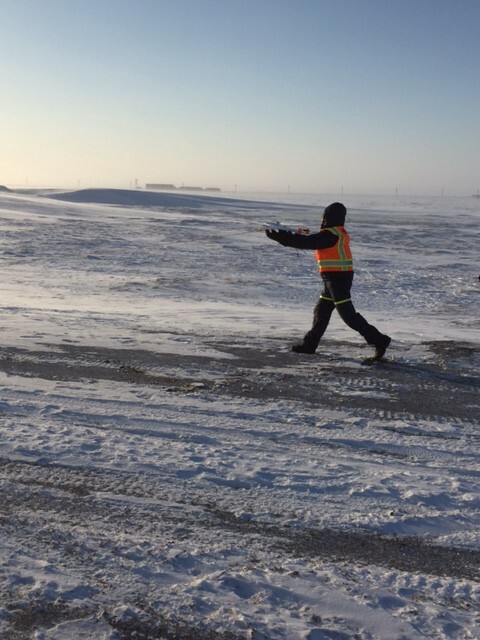 While the forecast was for 25–35 mph winds, the observed winds at the surface were in the 15 mph range, which is totally flyable for the DataHawk. We also started to prepare the Pilatus for flight — there was substantial optimism and excitement about the potential for a great morning! At 8 am, we launched the first DataHawk — right off of launch it became apparent that maybe things weren’t as calm as they seemed… The airplane was having some difficulties and was seemingly getting tossed around at pretty low altitudes (around 50–100 meters). It’s hard to say for sure, but we think that there was substantial wind shear between the stronger winds aloft and the much lower wind speeds near the surface. To make matters worse, we began experiencing intermittent communications issues. After troubleshooting this for a bit, we came to the conclusion that the radio we were using on the aircraft was misbehaving, and went back to the facility to replace it. After replacing the radio, winds had started to pick up a bit, but we decided to give it one more go. Again, it became obvious very quickly that the aircraft was over-matched by the conditions, and after another hard landing, we packed it up and returned to the AMF-3. When we got there, we found that the winds were back up to around 25 mph. Gijs launching a DataHawk this morning, before the winds picked up again. Since then, we’ve spent the afternoon sampling aerosols on the roof with POPS and going over the last few DataHawk flight files to get a better look at the behavior of the airplane. On the bright side of this morning’s short flights, we did see some activity that looks like radar interference, and the plane seemed to be able to reset its autopilot while in flight. However, because we were not flying using the autopilot at the time, it is impossible to say what would have happened if the plane were flying itself. We hope to get some more opportunities to test this out, but the forecast continues to call for heavy winds. It is amazing to me that we can have two straight weeks of winds above 20 mph, with no end in sight… Even more amazing that when we departed Anchorage on 4/2, this was not really in the forecast at all! I guess that’s part of the reason we’re up here — to improve the predictive capabilities of weather and climate models!